The "dribble-drive motion offense" is one of the latest, popular offenses seen at the college, pro, and high school levels. 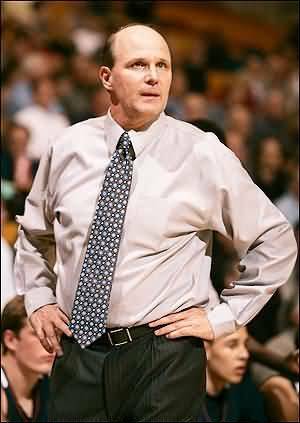 The original innovator is Vance Walberg of Fresno City College and Pepperdine, and now assistant coach at UMass, and he called it his "AASAA" offense... meaning "attack, attack, skip, attack, attack". This is a guard-oriented offense that features spreading the floor and dribble-penetration to the rim for lay-ups or kick-out three-point shots. Coach Walberg uses the term "key or 3" meaning either a layup, or a 3-point shot. This offense uses a 4-out set. O1 and O5 are like double point guards, and their mentality is to attack with the dribble first, and are outside shooters secondly. O2 and O3 are set deep in the corners (and must be patient) and they are shooters first and dribble-attackers secondly. The post player does not look to post-up, but rather plays on the opposite block, elbow or short corner... as this creates more open lanes for dribble-penetration. The post player looks for lobs, or dump passes from penetrating perimeter players, and looks to "clean up" inside with offensive rebounding. Let's discuss these together as they are related. In order to be able to drive to the hoop, we must have good spacing and gaps to penetrate. Important rules for spacing for perimeter players are to rotate to their correct positions as the ball moves (discussed below), and to keep outside the 3-point arc. If a perimeter player dribble-penetrates and then passes back outside, he/she must clear out and get back to the 3-point arc. The same is true if he/she should cut inside... get back out to the arc if you don't get the pass. The post player O4 must be constantly moving as the ball moves, always to the weakside, so that he/she is not in the way of the dribble-penetrator. At other times, O4 must "T-up" (slide up into the middle of the lane), as on baseline dribble-penetration (discussed below). Look at the diagram. On the left, we see "single gaps". These are difficult to dribble-penetrate because help defenders are in good position. By moving O2 and O3 deep into the corners, as seen in the right diagram, we create "double gaps", which are much easier to attack. Further below, we will even discuss how to create a "triple gap". First, we need to define some important terms, our various "zones". Break-down Zone... where perimeter players will try to break-down the defender 1-on-1. Rack Zones... where the attacker finishes with the layup. Drop Zones... certain options if the dribble-penetrator stops here. Drag Zone... certain options if the dribble-penetrator is stopped here, without shooting. You need four perimeter players who can handle the ball and attack the seams 1-on-1 with dribble-penetration and then finish, and who can also catch-and-shoot the 3-point shot effectively. On dribble-penetration, the ball-handler has several options including... (1) finishing the lay-up, (2) dumping it to the post player on the opposite block, (3) passing to a back-cutter inside, or (4) passing it back out to the three point arc for the outside shot. The main thought process however, should always be "get to the rack"... the other options are there if the player with the ball is stopped by the defense. The diagram above shows the dribble lane options for each perimeter spot. O1 and O5 have two dribble-lane options... lane penetration (up the lane line) and middle penetration. O2 has two dribble options... middle and baseline. O3 has one dribble option... just middle penetration. We don't want O3 to dribble baseline, as the options are not good here with O4 often on that side. Next, we'll discuss these dribble-options. O1 has two dribble-penetration options... (1) up the lane and (2) to the middle. Diagram 1 shows O1 lane-penetration. His/her thought is "get to the rack" and score. O5 slides behind O1, and might get the return pass from O1 (diagram 2), if O1 stops in the "drag zone"... here O1 makes a reverse pivot and passes back to O5. Notice that O3 rotates up to the high wing area. O3 must find the "open window" here, open for a pass from the dribbler. O4 stays on the weakside and looks to rebound and "clean-up" a miss. O1 could also pass to O4 if the X4 defender moves over to stop O1. Also in diagram 2, once O1 passes, he/she clears out quickly to the opposite corner. Diagram 3 shows O1 middle-penetration. Often the X1 defender will try to deny lane penetration, and overplay O1's right side. So O1 simply makes the cross-over and dribble-penetrates the middle. O4 re-locates to the right side of the lane. O5 initially moves right (to accept a possible kick-back from O1), and then moves back to the lane line once O1 attacks. O2 rotates up and O3 stays deep in the corner. O5 has two dribble-penetration options... (1) up the lane and (2) to the middle. Diagram 4 shows O5 lane-penetration. His/her thought is "get to the rack" and score. O1 slides behind O5, and might get the return pass from O5. O4 re-locates to the right block. O2 slides up to the high wing spot. It's very important for O2 (and O3 above) to find and move to the "open window" for an open pass from the dribbler. Diagram 5 shows O5 middle-penetration. O1 initially moves left (to accept a possible kick-back from O5), and then moves back to the lane line once O5 attacks. O3 rotates up and O2 stays deep in the corner. O2 has two dribble-penetration options... (1) middle and (2) baseline. Diagram 6 below shows transition. Notice that O2 and O3 are high on the wing when the ball is still in the back-court, as we always want O1 (and O5) to try to pass quickly up the court to either O2 or O3. If the ball is not passed up the floor, once it crosses half-court O2 and O3 move down to the corners. In diagram 6, we see O2 middle penetration. O2 gets the pass and immediately attacks the middle. O4 re-locates to the right block. O1 fills in the spot vacated by O2. If O2 gets stopped inside, he/she could always reverse pivot and pass back to O1 or O5. O5 fills in his/her usual top left spot. Diagram 7 shows O2 baseline dribble-penetration. O4 "T's-up"... i.e. slides up into the middle of the paint for a possible dump or lob pass from O2. O3 goes to the corner for a possible pass there from O2. If O2 gets stopped inside, he/she could always reverse pivot and pass back to O1. O1 fills O2's spot and O5 goes to his/her usual spot on top. SIGN UP! Become a Member! "Drop 2, 1-4 Give and Go"
"Drop 3, 1-4 Give and Go"
You can see how players must keep moving with this offense, maintain their spacing, create double and triple gaps, and think "attack" at all times. To counteract this offense, defenses may use a sagging man-to-man, or "pack-line" defense, or may use a zone defense to clog things up inside. So you will also need to practice your zone offense as well! You will notice that there is no screening in this offense. So you avoid moving screens and having to spend time teaching players how to screen correctly. You can of course work in some screening, some simple pick-and-roll and pick-and-pop plays. Dribble-Drive Motion Offense - More! By Vance Walberg, former University of Massachusetts Assistant Coach. with John Calipari, University of Kentucky Head Coach. with Fran Fraschilla, ESPN analyst, former college basketball coach. with Jerry Petitgoue, Cuba City HS (WI) Head Boys Basketball Coach, 3 times Wisconsin State Championships. Copyright © 2001 - 2019, James A. Gels, all rights reserved.